On September 24-25, 2017, CBS hosted their 4th annual RE Facility Conference. 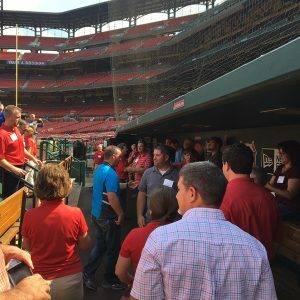 Cooperatives were invited to join the RE Conference held in St. Louis Missouri, where industry leading experts discussed topics such as facility security, strategic planning, current design trends, and control center technologies. To conclude the conference, #1 National Bestselling author, and St. Louis native John O’Leary moved the audience on the topic of “Living On Fire”. Attendees were then taken to Busch Stadium to visit the VIP Suites, tour the stadium, walk on the field, and then enjoy a fun evening watching the Cardinals take on the rival Cubs.